Roshan Khan will complete the Cardiff University/Cardiff Half Marathon less than a year on from undergoing a quadruple heart bypass, all in the name of Cardiff & Vale Health Charity. The journey that led Roshan to take on the iconic 13.1 mile course began following the loss of his wife to breast cancer in 2015. He began to feel pains in his chest, but put it down to grief and a lack of fitness in his bid to get back in shape. After battling against the discomfort, he finally went to his doctor, who referred him to the Cardiology department at the University Hospital of Wales (UHW) in Cardiff for crucial tests. The experts found the root cause of Roshan’s problem to be angina and a blocked arteries. The only solution was a quadruple bypass, but remarkably, Roshan is preparing to complete the Cardiff University/Cardiff Half Marathon less than 12 months later. “I would never have thought I would be in a position to run a half marathon so soon after my operation. But once the initial rehab period was complete, I’ve been able to get back to Park Run and I completed my first 5K about four weeks ago. “Now I’m building towards the Cardiff Half on October 7. I’m just aiming to get around the course, but at the moment, everything is looking good. I couldn’t have imagined I would be in a position to even get on the start line, but I can’t wait. 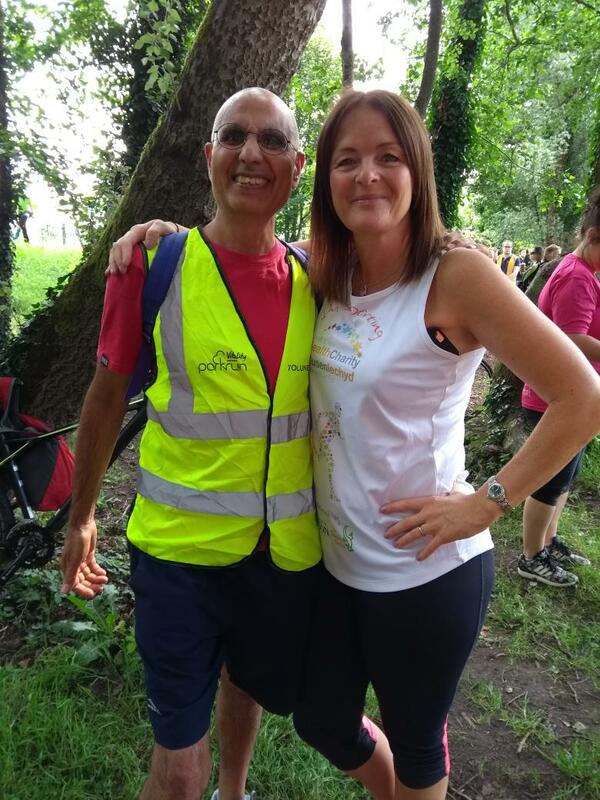 Roshan’s journey to 13.1 miles was boosted by an unlikely meeting with Dame Kelly Holmes at his local Parkrun this month. He has already raised close to £150 but is aiming to hit the £500 mark for the Cardiff & Vale Health Charity before race day on October 7. If you would like to support Roshan please visit: https://www.justgiving.com/fundraising/Roshan-Khan2 or by texting: ROSK60 with your amount £ to 70070. If you would like to run the Cardiff Half Marathon as part of Team Health Charity, please contact Cardiff & Vale Health Charity on 029 2184 1802 or email fundraising.cav@wales.nhs.uk. Spaces are free in return for a small amount of fundraising.